Ailish Tynan, winner of the BBC Cardiff Singer of the World Rosenblatt Recital Prize in 2003, has ever since had a successful international career; the biography lists quite a number of opera houses in Europe and the US, including the Royal Swedish Opera, where I saw her Sophie in Der Rosenkavalier in 2008 and a year later as Atalanta in Handel’s Serse. Looking back over my reviews I found that I admired her “lovely lyric soprano with easy top” in Der Rosenkavalier and that her Atalanta was “spirited and delectable”. Now 6-7 years later I was deeply impressed by her bright, beautiful voice and her admirable care for nuance. She also excelled in lovely pianissimos – just as she did as Sophie. I also noted that at forte her vibrato has a tendency to widen considerably – in Gretchen am Spinnrade for instance. However, she sings with strong feeling for the texts and articulates well. Her rendition of Todesmusik is touching – a song, incidentally, that is a relative rarity. Schwanengesang is another deeply felt song. It is also good to have all three of Ellen’s songs. While Ave Maria is well-known to everyone, both Raste, Krieger and Jäger, ruhe von der Jagd are well worth the occasional outing. The latter with its keen rhythmic forward thrust is charming. As for Ave Maria it is forever associated with Marian Anderson’s legendary recording from 1938. Her dark, warm and rounded tone is something that Ailish Tynan’s bright and clear tones can’t quite match, even though her reading has its own validity. She is better suited to Die Forelle, which is one of the best on this disc. She also gives an inward and touching reading of Wandrers Nachtlied, and Lachen und Weinen is suitably light and airy. That said, Sei mir gegrüsst is too monochrome and Du bist die Ruh hasn’t quite the seamless legato one ideally wishes. 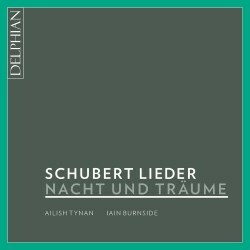 Ständchen (Horch, horch, die Lerch) is good and Nacht und Träume is well conceived but as in several of the songs the over-wide vibrato lessens the impact. Iain Burnside is, as always, excellent and the recording is good. There are many good things here but I recommend prospective buyers listen before purchasing.